Gartan National School of Churchill, Letterkenny, wins out over 113 schools and 9 Education Centres nationwide. 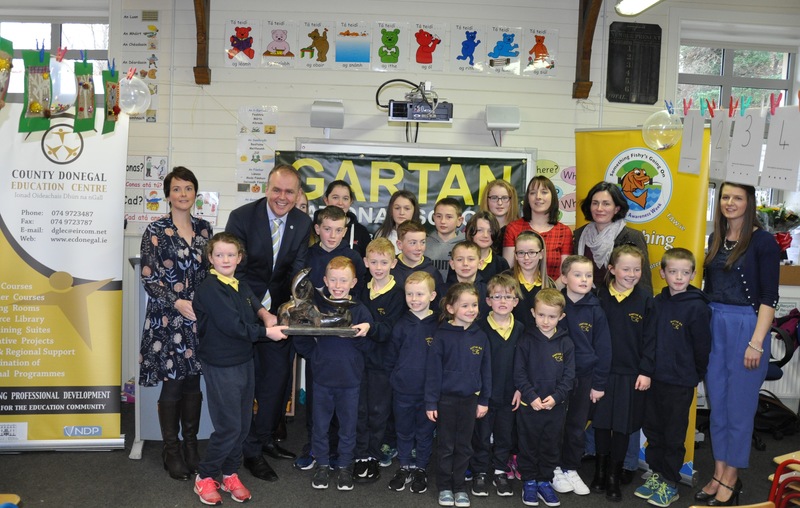 Friday, 24th November 2017: Gartan National School of Churchill, Letterkenny, County Donegal, has been named the winner of 2017 national ‘Something Fishy’ competition. The students were presented with the National ‘Something Fishy’ perpetual trophy and a money prize for the class by Joe McHugh TD, Minister of State at the Department of an Taoiseach at the school today. The ‘Something Fishy’ programme is an annual educational initiative of Inland Fisheries Ireland, in partnership with Blackrock Education Centre, which allows students to learn about fish and the environment in a local context. Director, Jacqui Dillon, and Siobhan Martin, of the Donegal Education Centre facilitated the programme in the Donegal area. The Gartan National School students were announced winner of this year’s ‘Something Fishy’ competition after an independent judging panel, comprising of fisheries officers and education staff, selected their entry. Minister McHugh was fulsome in his praise for the winning school and those who assisted in its success: “There could not be a more appropriate setting for a winning school than one sited in such an idyllic setting surrounded by nature on the shores of Gartan Lake, and I am immensely proud to be here to present the award in the school itself. Winning the overall national award is a tremendous honour for the school, for the Letterkenny area and for Donegal”. The 2017 ‘Something Fishy’ programme saw 3,390 children from across the country taking part in 113 schools and 9 education centres nationwide. Eight different lessons were studied in the classroom before the students were visited by Inland Fisheries Ireland staff who introduced them to ‘river life and its surrounds’. End of term projects were based on something learned from the ‘Something Fishy’ experience. The students were invited to submit digital class projects with special reference to Inland Fisheries Ireland’s involvement. Since the inception of ‘Something Fishy’ in 2005, approximately 50,000 children have participated in the initiative which aims to promote interest and understanding in fish and their habitats. Gartan National School is a co-educational primary school. The school is located in an idyllic setting on the shores of Lake Gartan surrounded by the Derryveagh Mountains on the edge of Glenveigh National Park, near Churchill Village, 20km North West of Letterkenny. While the school is under the patronage of the Church of Ireland it welcomes children from all faiths. The school dates back to 1911 when the original school was located approx. 4km away in a building which is now a private residence. Twenty children are enrolled in the school under the care of two staff members – Ms. Clare Murray and Principal Ms. Caroline Carey.